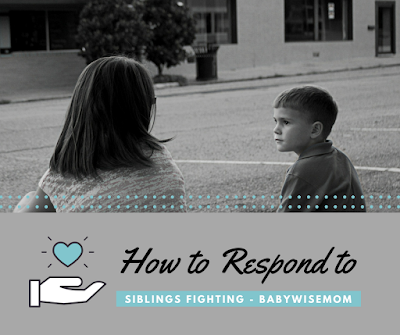 When your children fight, you might not know how to best respond. You don’t want to create bitterness among the siblings. You also want them to learn to solve problems without your intervention. This post outlines tips on how to respond when you children fight. The best of times and the worst of times. Sibling relationships are like that. Lots of good. Plenty of bad. The good warms your heart and the bad warms your blood pressure. The question parents encounter is “What do I do when my kids fight?” Do you intervene or do you let the children settle it themselves? Do you ignore it? How do you respond to tattling? 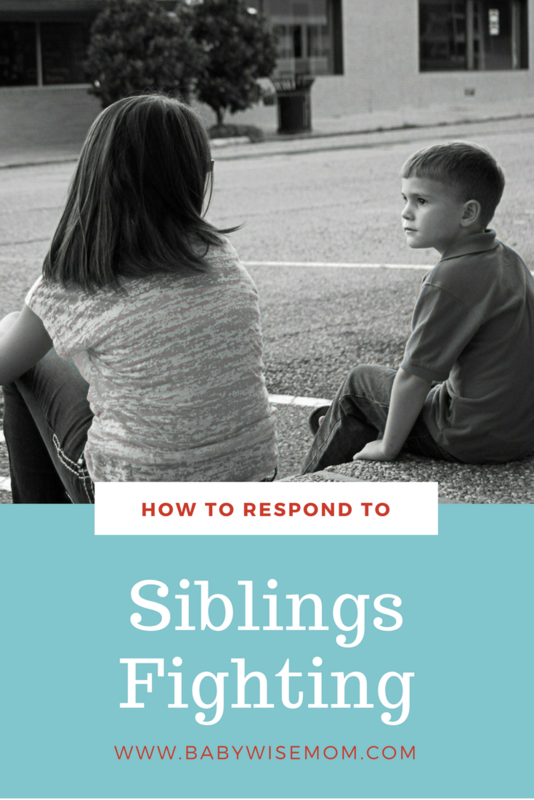 None of these questions have simple, quick black and white answers, but I hope to give you a guide in how to handle quarrels among siblings. This advice is based on how we respond to fighting at our house. As a bit of anecdotal credibility, I have four children, ages 4-11 (almost 12). We have some fighting, but not much. For the most part, the children get along. One summer at an extended family camping trip, a few days into it my children “finally” had an argument. My cousin was thrilled to see they actually fought sometimes! They do fight at times, but it isn’t even a once-a-day thing here. What we do works well for our family. I am a huge proponent of the idea of “prevention” for any problem you are facing (or concerned about facing someday). The first step to managing fights among your children is to prevent them. Sounds nice, right? One way to do prevent fights is to teach your child to love others (see my post Moral Training: Love). While children are naturally loving creatures, they are also naturally selfish (aren’t we all!). Teaching your child how to think of others and ways to show love toward others is a very helpful and positive step in helping your child get along with siblings. Along the same lines of loving, foster a friendship between your children. Your children will be more motivated to work toward getting along if they are friends and not just siblings. You can prevent by teaching your child how to prevent conflicts from happening–or rather conflict resolution in early stages of conflict. When your children disagree, talk about what happened and what could have been done to prevent the fight from happening in the first place. What things should have been done differently? What things should have been said and not said? How could they have been less selfish? Children need to be taught these things. You can also prevent by making sure your children are well-rested, well fed, and have a good routine going in life. This is setting your child up for success in playing with siblings. Children are more likely to fight when bored, tired, and hungry. This is along the lines of prevention. Establish rules for playing together. Again, children aren’t necessarily born knowing how to treat other people (I say necessarily because I have one child who at age 3 showed obvious signs that she understood better than I did how to be a good hostess, so some children are either born knowing things they shouldn’t know or pick it up so fast it seems like they were born that way). Have rules like “absolutely no hitting each other,” or “absolutely no biting.” Have clear and immediate consequences when these things happen. I have a zero tolerance policy for physically harming each other. I don’t care how mad the other person “made” you. It isn’t okay. My kids don’t get to play with other people if they hurt them. And while we are on the topic, my children are taught that no one makes them feel or do anything. They choose their reactions to situations. We have rules on how to treat each other emotionally. I do not allow my children to be rude to each other. I don’t even allow things like eye-rolls and exasperated sighs. I expect my children to treat each other with as much respect and kindness and they would treat any person in the world. I don’t think, “Eh. That’s what siblings do!” No. I teach them that siblings are kind to each other. Siblings have each other’s backs. Siblings are people in the world you can count on to love you most and stand up for you. We also have rules that activities like wrestling, pillow fights, and tickling are all okay so long as everyone involved wants to be involved. All parties must be consenting. As soon as someone wants to be done, that person gets to be done. We also establish clearly that if you participate in the wrestling party, you will most likely get hurt, and it won’t be anyone’s fault. Establish rules for sharing, also. What are the sharing policies in your home? Decide and explain it to your children. Have clear consequences for when sharing becomes a problem. 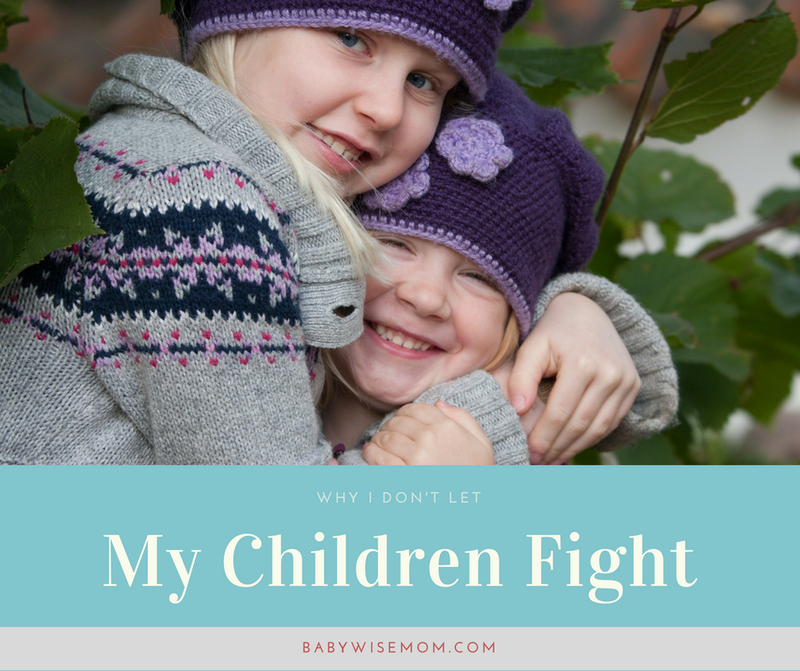 When you hear your children fighting, wait for a bit to see if they can work it out among themselves, assuming they are not physically harming each other. I always give my children a chance to work it out and most of the time, they do. Now remember, I have worked for them to have a positive relationship and I have taught them rules and how to prevent conflict. Now when they have conflict, it is practice time. A lot of sibling conflict is short lived and will be resolved quickly if we allow children the chance to work on it. See my post Making Children Mind…Siblings Fighting for more on this concept. But stay close by during the conflict resolution and in ear shot of the conflict. There are times to intervene. Sometimes you do need to intervene. If your children are not working toward a solution and things are just escalating, intervene. If they are hurting each other, intervene. If an older sibling is essentially taking advantage of younger children and “getting his way” unjustly, intervene. Here is what intervention is not–it is not solving the problem for your children. You don’t walk in the room and try to get the full background story and then decide who ‘wins’ the argument. When you intervene, you help the children solve the problem. In the book Siblings Without Rivalry (affiliate link), the author suggests you describe what you actually see–facts, not value judgments. Help your children resolve by acknowledging the feelings of each child. Explain to each child the point of view of the other child. Children aren’t good at doing that and they aren’t good at considering the point of view of others. Once you explain it, though, and ask them to imagine themselves in the other person’s position, they usually get it. Please understand that I fully am okay with my children disagreeing with each other. That is totally life and that will happen so long as they are living. I want them to learn how to navigate disagreements correctly. If they have a disagreement that balloons into yelling, leads to “I’m not playing with you,” or leads to physical aggression, I step in and we talk about how the disagreement played out and how it could have been handled better. I expect them to work through their disagreements and come to a consensus. My family is comprised of 6 people. 5 people like to be in charge. We have only one “yes, sir” person, and that is dad! We have varied points of view constantly with strong feelings behind them. That is great and fantastic! We all need to be able to work together to find common ground. Like I said, I have zero tolerance for physically harming each other. If it happens, they are no longer allowed to play with each other for a length of time. They like to play with each other, so this punishment is very suitable for attaining my desired results (don’t hurt each other). Sometimes I find bickering happens when the children have been playing too long with each other. I try to have independent play time strategically positioned in the day. If I am too late and the bickering is happening, we take a break for room time. After some time alone, the children are usually ready to play nicely with each other again. Balance free play with structured play. I try to not take life too seriously. Something that I find highly grating to my nerves is tattling. Because of that, I need responses to tattling that will help me remain a nice person while dealing with the tattling. Tattling is a delicate issue with children. I want my children to come to me when needed, but I also want them to work on solving their own issues. I don’t need to know every time someone looks at another person wrong. I have a rule–you may not tell me something in an effort to get the other person in trouble. If the intent is to get the other person in trouble, then the tattler gets the same punishment as the person being tattled on. This works in our home because the kids are for the most part well-behaved and I don’t have co-conspirator children trying to get away with things. Sometimes I respond to ridiculous tattling (he looked at me!) in an overly dramatic way, “[GASP!] What should we do?!?!? Should we make him wear a blindfold for the rest of the day?” The child always responds to such ridiculous suggestions with a half smile and a “no.” Then I move on seriously to, “Then what do you want me to do?” and we work through what can be done to help the situation. With a little prevention, clear rules, a good schedule, and intervention when needed, your children can learn to get along with each other and learn how to solve issues themselves. Always remember, however, that you are responsible for teaching them how to navigate life. Take the steps necessary to guide your children toward a harmonious relationship.